The Marvel Cinematic Universe lumbers on in its oh-so-predictable way with the latest entry, Guardians of the Galaxy Vol. 2. It’s not that this isn’t a well-made, entertaining film. The problem is that it plays things so damn safe. It’s a space opera but with enough pop culture references that non-geeks aren’t left cold. There’s a peppering of adult humour but enough cute kids’ stuff that the whole family will be entertained. And there are big action scenes but there’s no sense of danger because everyone’s bizarrely indestructible. 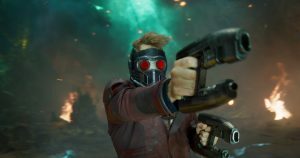 Long-time readers will know that I didn’t really see all the fuss about the first Guardians film – despite other viewers finding it a breath of fresh air, for me it failed to stand out from the other Marvel films. So it comes as little surprise that returning writer/director James Gunn doesn’t do anything different here. Actually, that’s not fair. Vol 2 is different insofar as it’s essentially rudderless until the last half hour. In a very strange storytelling decision, everyone’s just bumbling along without direction until right before the climax. At that point, the story suddenly begins, and then it’s one epic VFX explosion after the other until it ends. And the effects follow the tried-and-true big-budget Hollywood trend: some are extraordinarily good, others are awful. Being set in space or alien worlds for the most part, Guardians can cheat a lot – it’s not like things have to look too “realistic”, but this film really does throw everything at the wall. It feels like the actors would have spent most of their time in front of a greenscreen. Speaking of the actors, they all fill their roles capably. The characters from the first film aren’t really taken out of their comfort zone, excepting perhaps Michael Rooker’s Yondu. Kurt Russell continues to enjoy his recent return to the limelight, and he puts in a decent turn as Ego. Three other cameos are actually the ones that piqued my interest the most, but I’ll leave their names out for fear of spoiling things. My hopes are that said mystery people will have a bigger role in the third film. The complete lack of threat is really what kills this film for me. People dangle off the end of spaceships that are crashing through forests, or fall several stories to the ground with nary a bruise. The best part about the short-lived ‘Firefly’ TV show (and, by extension, Serenity) was that Mal Reynolds looked like he was getting hurt when he exchanged blows. (A habit Nathan Fillion picked up from Harrison Ford.) Here, Peter Quill/Starlord is fine no matter what kind of apocalyptic scrapes he gets himself into. Lack of consequences is something that the MCU often comes under fire for (looking at you, Captain America: Civil War) and you’d think that Guardians’ narrative distance from the rest of the films would allow them to take some risks. Not so, here. Look, if you loved the first Guardians, chances are you’ll like this one too. For me, it’s a case of forgettable characters jumping around an action film that’s entirely lacking in insurmountable odds – something that I’d argue is a required element of any superhero movie.